There has been talk about how the world’s bee population is at risk of dying out. How will this affect the amount of food available for consumption? One Swiss start-up aims to prevent this from happening with wild bees (not the same species as honey bees): These bees can be kept as "pets," and they ultimately help local farmers grow their crops. Wildbiene + Partner (the "partner" is you!) is the brainchild of ETH biologists, a social and sustainable business supported by the Impact HUB Zurich and WWF Switzerland. They have designed BeeHomes that are built in Switzerland by approved institutions for those with disabilities or in need of work. Having a BeeHome at your home is a fun learning opportunity about how bees live. It is also a great way to support social and environmental causes. How Wildbiene + Partner works, and how it helps Swiss farmers. After you purchase a shoebox sized bee home, Wildbiene + Partner sends you a BeeHome and 15 bee cocoons ready to hatch during spring. The deal is simple: Let the bees enjoy your garden or balcony while multiplying, and in return they will pollinate all the plants in the vicinity of your home. In September, you will send the BeeHome full of "baby bees" back to Wildbiene + Partner. They will care for the hibernating bees by freeing them from parasites and preparing them for the farmers in the spring. In the spring, you will get your renovated BeeHome back. Once again, you will get 15 new bees ready for another season of warm weather breeding. Not only do you get to have some wildlife nearby, but you also help grow food for the rest of us. That's all good, but what about stinging or aggressive bees? 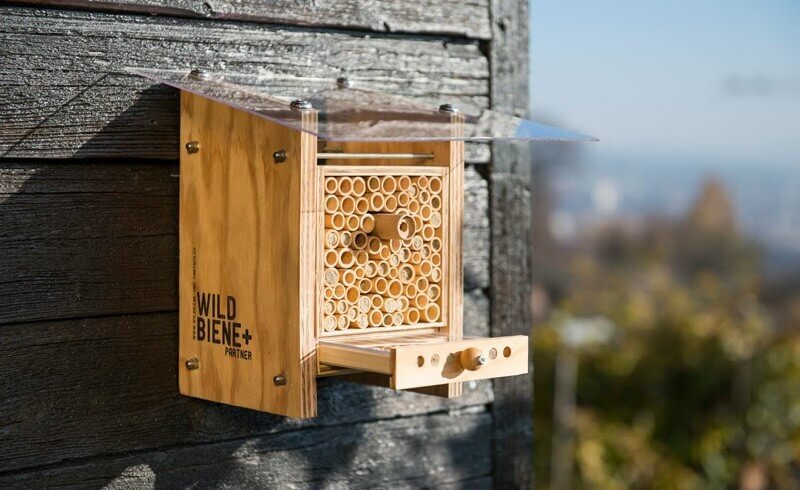 Wildbiene + Partner uses mason bees for their homes. These bees are absolutely harmless, they do not sting and are not interested in our food, sweets or soft drinks. The BeeHome that houses your pet bees can be mounted without hesitation on a balcony downtown, on a family house in the countryside or in a garden in the mountains up to about 1000 meters above sea level. Because bees return to the nest they were born from, you know that your bees will most likely come home to you. Interesting: Why city bees are just as important as country bees. Establishing BeeHomes all over Switzerland rather than just around the farmer's land could make all the difference when it comes to their survival. Having a mix of breeding locations means a more diverse food supply for the bees, which could improve breeding success. Breeding happy bees is not just an enjoyable hobby, but also something that anyone can actively do to secure a good crop of food the next season. Check out simple instructions or order a BeeHome already. A California girl who is learning more and more about her new home in Switzerland. She enjoys sharing this experience with other "Newly Swissed" to help them feel a little more at home, too. When she’s not writing at her desk, Ashley is doing yoga, stand-up paddle boarding, traveling or is trying out a new idea.